My relationship with Spain, (or ‘España’ as us people more au fait with it’s ways like to call it, I mean – look, I’ve even used a frigging wiggly accent mark) has matured as I’ve grown older, especially my relationship with it’s food. As a young man, oft visiting Spain on holiday, I was indifferent to their fine culinary culture and traditions. Dining? Well when I wasn’t seated in a plastic stackable chair in a beachfront café scoffing knock off versions of British dishes, with the obligatory mound of chips and bemoaning the lack of ‘decent sausages and bacon’, I could probably be found in a McDonalds, contentedly tucking into a ‘taste of home’ in a completely non-ironic fashion. I was the epitome of a Philistine and looking back I’m almost embarrassed at how unsophisticated I was in my tastes. Fast forward 20 odd years, and I stand before you a sophisticated gastronome. A seasoned culinary traveller. Some might say handsome and rugged and I have often been accused of being sensitive and perhaps far too intelligent and impossibly beautiful. It’s a cross I have to bear. But the point is, nowadays I’d no sooner eat pseudo British food abroad than casually take a bite out of my own hand and wash it down with a swig of warm fruity, vintage urine. (I think you’ll all agree, the age is important). 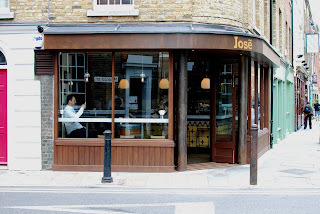 All of which leads me to new Bermondsey Spanish tapas bar José (well not all, ignore the tucking into hands and the imbibing of piss bit, you silly). It’s good, bloody good in fact. Which isn’t entirely surprising as José Pizzaro, ex head chef of the cracking Tapas Brindisa and extremely nice bloke, is running the show. 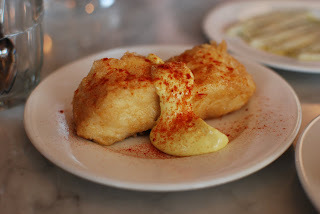 It’s certainly one of the most authentic tapas bars you’re going to find in London. It’s small. A short bar runs down one side, with a very compact but beautifully put together open kitchen at one end. There are a couple of tables, some barrels and a few stools lining the bar. A few Jamón swing lazily from the ceiling, a glass chiller cabinet built into the counter displays spankingly fresh fish. A chalkboard announces a handful of specials based on what’s available that morning at nearby Borough Market. That’s it. Entirely authentic in it’s simplicity and the freshness of the ingredients. There’s no booking, it’s very much first come, first served and not unsurprisingly, by all accounts it’s been absolutely packed since it opened a few weeks ago. ‘E’ and I turned up as the doors opened for lunch at 12 o’clock, and straight away pounced on the large central table whilst almost simultaneously ordering a chilled glass of Fino. I love, love, love a nice glass of cold dry sherry, Fino or Manzanilla purlease. 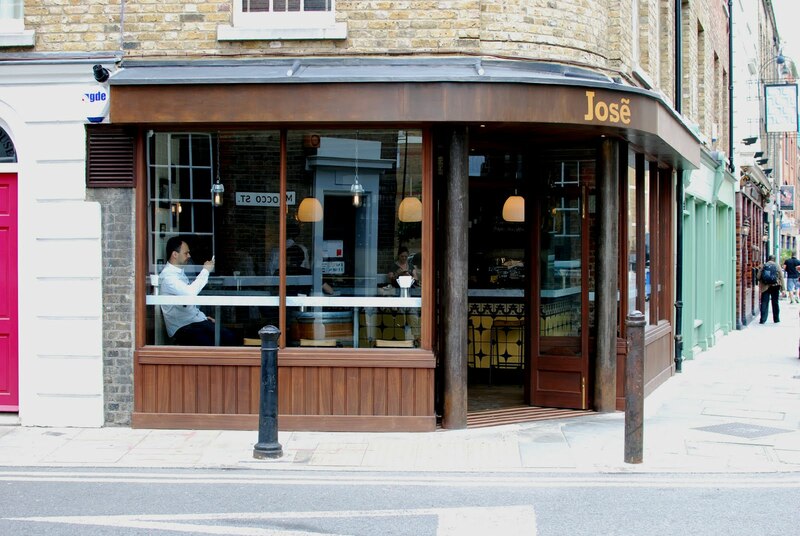 It’s the absolute perfect accompaniment to tapas, and happily at José, there’s a nice selection on the wine list. At this point our friends arrived for lunch, and we promptly ploughed into ordering . Between the six of us we managed to cover a hell of a lot of ground, and spanked the menu heavily. To begin, a plate of salted Marcona almonds were the perfect nibble to accompany our second glass of sherry. 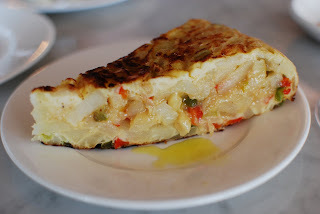 Quickly followed up by a cracking slice of Tortilla. As I’ve got older, the intense fishy saltiness of anchovy has grown on me. 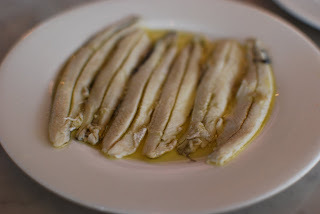 Boquerones in cava vinegar (Fresh anchovy fillets marinated in vinegar until they become white) that we were served at José were by far the best I’ve ever tasted. Subtly meaty and tangy. Absolutely cracking. 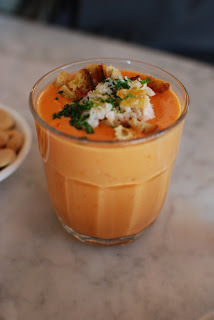 A glass of gazpacho with crab from the specials board was phenomenal. I could have eaten it all day long. It was probably one of the best things I ate, and if you go there I urge you to order it. 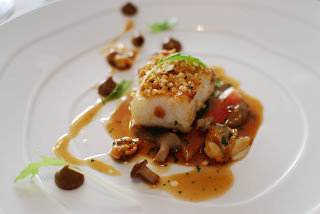 Not far behind in terms of sheer enjoyment, hake with allioli. A perfectly light, almost ethereally battered piece of fish with a generous accompanying dollop of rasping creamy garlic tang. Superb. About this point, we started to crack into the Manzanilla – did I mention how much I love sherry? 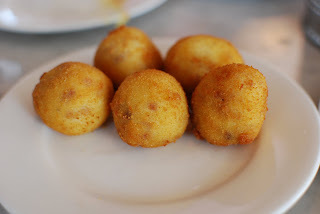 The croquetas which, when bitten into slowly oozed liquid béchamel and ham were beautifully done. A generously heaped plate of mackerel escabeche followed, and although not one of my favourite dishes was very good in its fresh clean tangy taste. 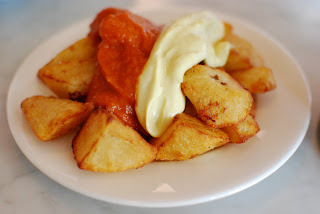 A cracking bowl of patatas bravas draped with dual slicks of allioli and a smoky brava sauce are incredibly moreish. I could sit and drink gallons of sherry whilst picking at these for hours. 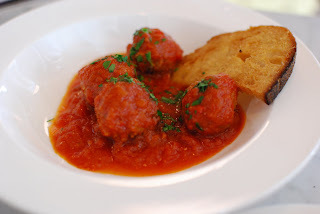 Lamb meatballs in a tomato sauce are good; although the accompanying toasted bread feels perhaps a bit redundant in that it’s far too thin and crisp to mop up the accompanying sauce in a satisfactory manner. Or maybe, that's just me. 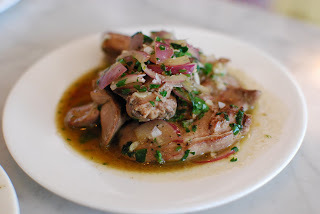 From the special board again, chicken livers in Oloroso are excellent. The sweetness of the sherry complimenting the subtle soft, almost smoky taste of the livers fantastically well. 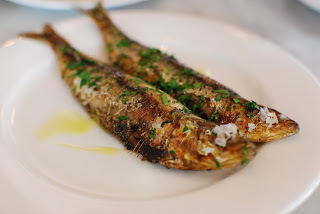 Also from the specials board, sardines cooked simply with lemon and parsley are delicious. I’m not normally a massive fan of oily fish, but these are obviously incredibly fresh and I’m surprised how much I enjoyed picking at them. 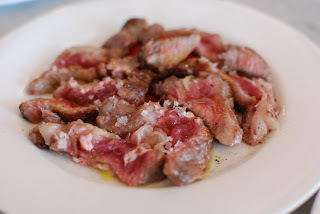 Saving one of the best dishes until last, once again, from the specials board – Pluma Iberica. A plate of thickly sliced, charred and salted pork loin cut from just about the best quality acorn fed pig you can eat. To be honest, its surprisingly rare appearance gave the impression of a good steak, and upon munching on a piece; it was decidedly strange to experience the taste of pork instead. It’s definitely worth ordering if you fancy trying something different. Finishing up the sherry theme with a sneaky glass of PX, we decided against ordering puddings. José is admirably authentic in that the Spanish don’t really go big on desserts. As such, simple dishes, such as a bowl of seasonal fruit with a splash of sherry feature. 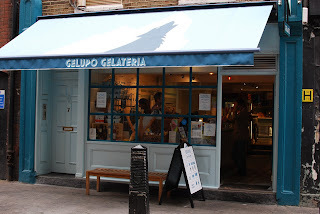 Leaving José’s a bit unsteadily, something to do with the gallons of Manzanilla we’d necked, we decided to head to Soho and the rather excellent Gelupo Gelateria for something sweet. It’s the first time I’ve been. I can’t recommend it highly enough if you’re in the area. 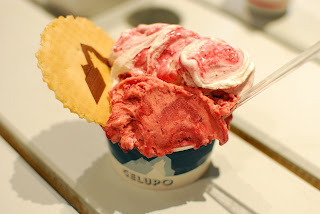 The ice creams and sorbets are bloody amazing, and surprisingly reasonable considering the central location. Just so you know, because I’m sure you’re wondering, I had summer pudding sorbet with an accompanying scoop of cherry and yoghurt ice-cream and it cost just three quid. Whilst I was licking the remnants from my tub of ice-cream and thoughtfully biting on the wafer, I considered lunch at José’s. It was really enjoyable. The food is supremely simple, authentic, rustic and fresh. It has a great, relaxed vibe, and it all feels extremely close to the experience of dining out in say, somewhere like Barcelona. If I lived nearby, on a hot summers day, I’d be popping in for some of the excellent gazpacho, a bowl of patatas bravas and a couple of gallons of Manzanilla far, far, too often. Shocking as it may seem to my regular readers but when it comes to food, at heart, I’m a bit of a peasant. I know outwardly I’m obviously a classy guy. Seriously suave and if you’ve never met me, you could be forgiven for thinking I probably talk like Roger Moore (I do). But my real food love is very rustic, simple food made with excellent fresh ingredients. Although saying that, variety is the spice of life. I’m not opposed to a bit of posh ‘Up West’ as they often like to say in Eastenders. So, when I read that Simon Rogan of Michelin starred L’Enclume had just opened Roganic, an outpost in London, and by happy coincidence I was due to be headed through London, back to the ‘Motherland’ (Essex). I booked a table for lunch straightaway. I'd heard of L’Enclume of course. I always plan to visit someday, but its Lake District location is a bit of a schlep. If I’m ever in the area, inexplicably, I imagine this visit will include me arriving at the wheel of a small boat, perhaps wearing a captain’s hat at a jaunty angle and smoking a pipe. I’ll be laughing in a decidedly captainish way and surrounded by an entirely new, more wholesome circle of friends who will also be laughing heartily and sporting a selection of lightweight summer knits. Until this eventually comes about (and it will), I’ll settle for Roganic. 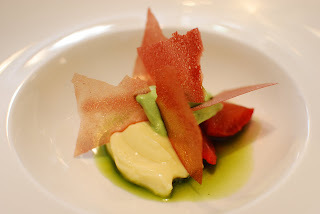 This small London incarnation of L’Enclume is interesting for a couple of reasons. It only has a short-term 2-year lease, so is something of a temporary foray into the capital’s dining scene for Simon Rogan and somewhat unusually, like it’s bigger Lake District parent, only tasting menus are available, 6 courses, or a whopping 10. Although on my visit, I was told this may be tweaked and a more conventional 3-course menu also made available. 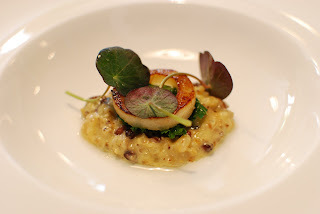 I met friend and fellow food blogger Niamh for lunch at Roganic on Friday. The restaurant itself is surprisingly light and airy for such a small space. Decorated in the fairly standard ‘fine dining contemporary bland style’, which is pleasant enough but is always slightly soulless and boring to look at. But then the food is the main event I guess and the sterile surroundings aren’t about to detract from that. I wonder if this inoffensive blandness in fine dining restaurant interiors is designed with this in mind? 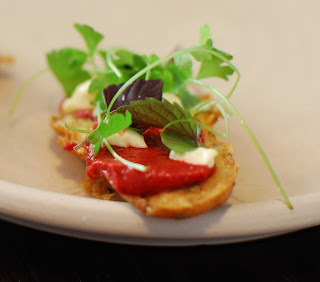 It seems we’d struck lucky, it was still the soft opening, therefore a rather welcome 25% off the bill (Result), and Simon Rogan himself was cooking (Also a result). After a brief conflab, we decided to go for the rather interesting looking 6 course tasting menu, priced at £55. But first, some wine. Niamh, knowing a hell of a lot more about quality plonkage than me, declared confidently that Slovenian wine is currently the absolute daddy with regards to quality and price. We went for a bottle of Quercus pinot bianco, and bloody nice it was too. You heard it here; (no doubt last), Slovenian wine is the way to go. An amuse of chickpea wafer, ox eye daisy spread, aioli and flowers was a really nice and light introduction to the cooking to come. Right away I’m going to be honest here; the menu is absolutely packed with interesting and sometimes slightly baffling ingredients. With the benefit of hindsight (and Google) I now know exactly what I was eating, but at the time, with my food rapidly going cold on the plate in front of me, ingredients such as orache, ox eye daisy spread and chenopodiums had me scratching my head. Nevertheless, that’s exactly what you pay for at this level of cooking, to be delighted, surprised and baffled at the artistry with unusual ingredients. Speaking of bafflement. There was a solitary smooth stone on our table, and it puzzled me. What could it be for? Perhaps something to stick the bill under? 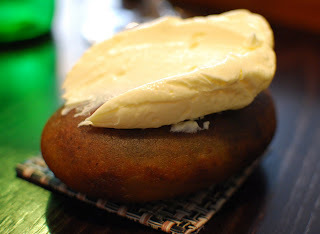 Our waiter arrived to answer the mystery by spreading a thick scrape of whipped butter, with Maldon sea salt onto it. Obvious really. Not. 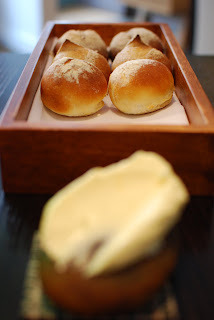 Then the perfect looking bread rolls arrived. A whole tray, potato, spelt and pumpernickel. They were all superb but especially the soft malty pumpernickel. A big thumbs up for the complete lack of parsimony with regards to the fantastic bread. The waiter cheerfully offered us more, and then when we’d greedily polished that off, even more. A rather dainty course of millet pudding, grains, burnt pear and Stichelton followed. It was good. Basically a risotto in all but name. Pear and Stilton is a classic combo, and Stichelton is an absolutely cracking cheese. A great start. The next course arrived and my jaw dropped. It was beautiful and elaborate, absolutely the most gorgeous presentation. 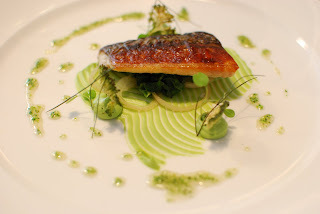 Seawater cured Kentish mackerel, orache (Which I now know is a foraged plant, similar to spinach in taste), broccoli and warm elderflower honey. Somewhat unsurprisingly perhaps, it tasted fantastic. The sweetness of the elderflower honey offsetting the tang of the onions, all balanced with the crispness of the mackerel and the vegetal notes of the broccoli and orache. Stunning. The next dish, almost impossibly, was better looking than the last. 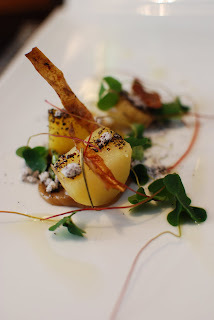 Heritage potatoes in onion ashes, lovage and wood sorrel. Beautiful to look at and who’d have thought a dish based around potatoes could be so bloody amazing? Easily one of the best courses I ate, mostly in part to the incredible sharp savoury taste of the onion ashes. (Onions, dehydrated and reduced to dust using some kind of cheffy wizardry). Amazing. Roasted brill, chicken salt, surf clams and rainbow chard was next. Something of an unusual combination to my mind, chicken and fish, but surprisingly it worked brilliantly. 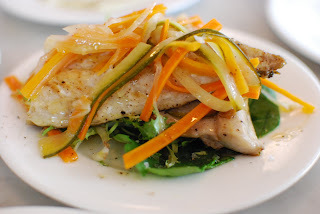 The sharp bite of the chicken salt, cutting through the softness of the perfectly cooked brill. Lovely. Another bit of artistry arrived in the form of Cumbrian hogget loin, artichokes and chenopodiums (Which Google tells me is another foraged spinach like plant). 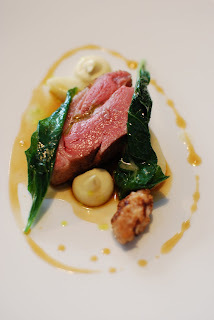 The lamb loin, so rare and soft, presumably cooked using sous-vide, was superb. The addition of a lamb sweetbread gave a nice offal flavour to balance the sweetness of the hogget. Once again, fantastic. Onto dessert, and sweet cicely with strawberry, buttermilk and verbena was, (to match the previous courses), appropriately beautiful in an almost architectural fashion. I don’t think I’ve ever tasted verbena before, and its flavour was a revelation. Unusual, flowery, and citrusy. The combination of tastes were interesting, light and fresh. A nice end to the meal. 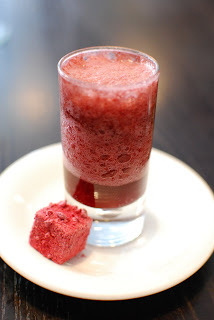 A final course, in the form of a cherry shot with a cherry marshmallow, and for me this was the one thing that didn’t quite work. The marshmallow was pleasant enough, but my shot seemed to be a bit on the insubstantial side, it didn’t fill my mouth with flavour as I’d expected. Somehow, all of the foam remained in the glass, and I looked around in vain for a spoon to finish it off. Not to be thwarted and reverting to childlike behaviour, I stuck my finger in it. (You can’t take me anywhere). This action broke the offending vacuum, and the remainder slid into my mouth. It was ok, but didn’t wow me like everything else had. Nevertheless, I absolutely loved Roganic. The food is just plain gorgeous. Easily the best looking dishes I’ve eaten all year, possibly ever. The menu is full of quality interesting British ingredients, some conventional, some (if you’re anything like me), you’ve probably never heard of. The staff were extremely relaxed, cheerful and friendly. 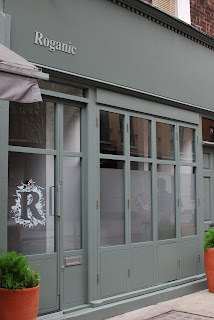 In fact, it’s all so slick that it’s hard to believe Roganic has only been open for a couple of weeks. Overall, I had one of the best lunches I’ve eaten for a very long time. Go.